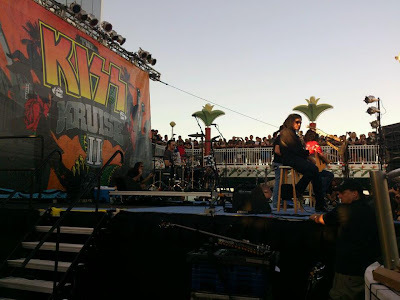 Here's the set list for KISS' sail-away unplugged show aboard the KISS Kruise II on October 31, 2012. A great memoir was recently released on the life of former KISS drummer Peter Criss. In the midst of his current book tour, we at BackstageAxxess were grateful that we were able to sit down and talk to this legendary drummer. We talked about his unique relationship with his mom. We also chatted away about his love of his idol Gene Krupa. 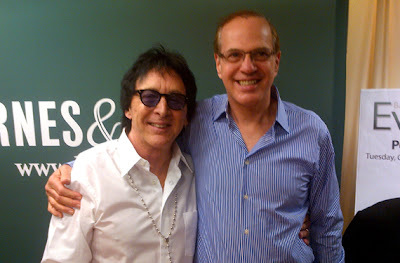 In addition, we talked about what took place when he signed his first record deal with KISS. Plus much more was discussed as well. What a true gentleman and nice guy. Our discussion was a delight and we hope you enjoy this as much we had bringing it to you. 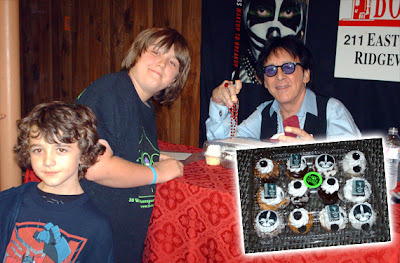 BackstageAxxess presents Peter Criss!!! KISS arriving for their unplugged set aboard the KISS Kruise II. 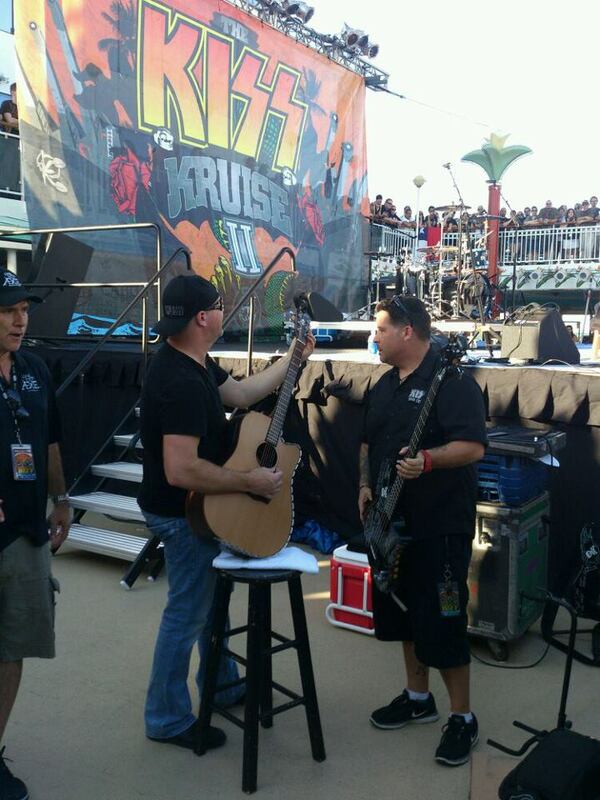 Here's a first photo of KISS unplugged aboard the KISS Kruise II. 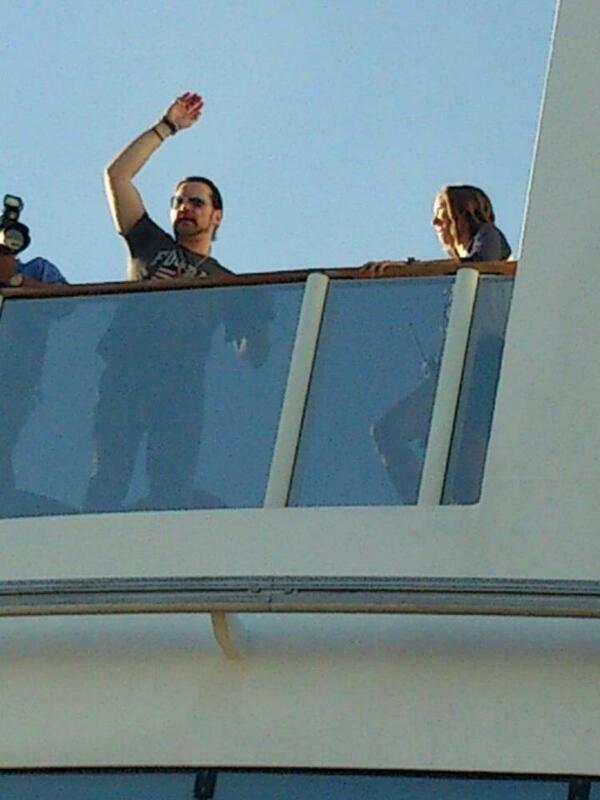 KISS drummer Eric Singer waves to KISS Fans aboard the KISS Kruise II today. 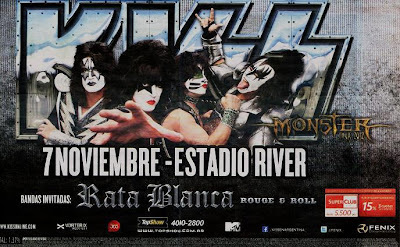 The local producer Garzia Group reported that they already sold 15,000 tickets for the KISS concert which will be held on November 12 at the Jockey Club. n all points of Ticketshow has intensified in the last days of the month of October, mainly in the Tigo building where the firm's clients can access a 20% discount on tickets for all sectors. This promotion will be extended up to 20 thousand tickets sold. 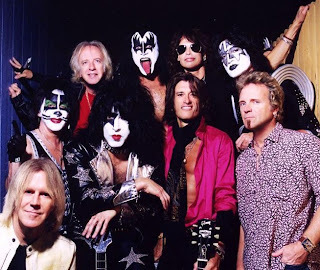 The legendary American rock band Kiss, reaches Paraguay for the first time within the framework of a new world tour to the delight of thousands of Paraguayan fans. 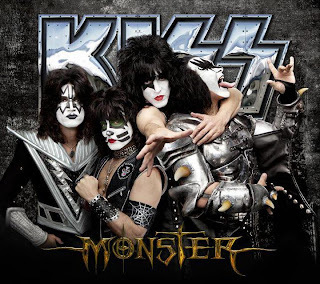 With more than 90 million records sold, the legendary band whose success goes beyond generations and a line in the history of music - which has marked a before and an after KISS - bring to Paraguay their new world tour promoting its new album, "Monster". November 12 will be in the "Jockey club of the Paraguay" in Asunción. Since its explosion in the music scene in the 1970s, KISS has created a new experience in the stage, mixing rock of first class with pyrotechnics, lighting and scenic fantastic environment along with makeup and costumes that have become a unique style. This gave them a reputation for having created one of the best shows live in the history of the music around the world. "Monster" tour is not the exception, in this tour fans can listen to the songs on the new album along with the more greatest hits of the band. The devotion that fans have is unique. 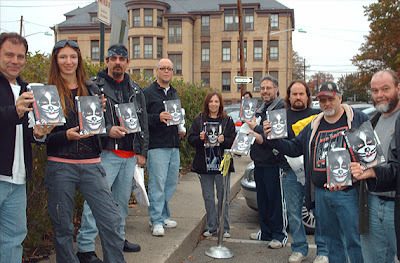 "KISS ARMY" is one of the greatest fan club on the planet. 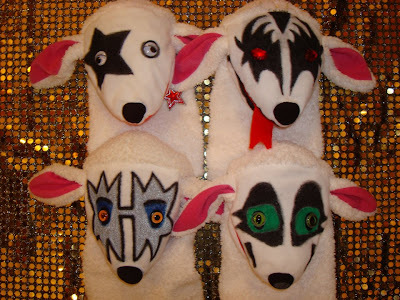 -Paul Stanley, Gene Simmons, Tommy Thayer and Eric Singer are KISS and are ready to "Rock" Paraguay! 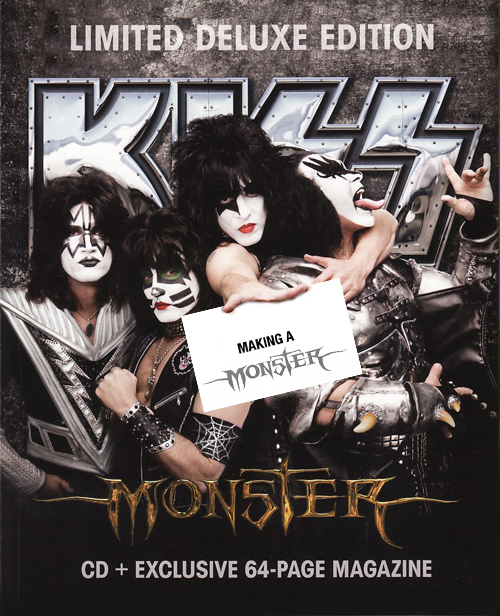 Paul, Gene, Tommy and Eric discuss "Monster" songs in the KISS Monster Deluxe Edition CD + exclusive 64 page magazine. Check out the "Tommy Tattoo" from our friend, Thorsten Hergesell from Germany! Artist Zsolt Varga (owner of Johnny Tattoo in Vilseck, Germany) took almost 50 hours to get all the details on Thorsten's skin. 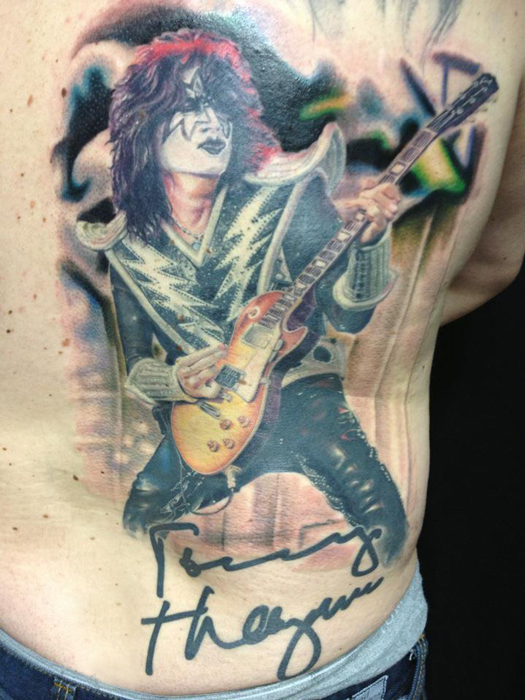 It took 13 sessions to finish...just in time for the upcoming KISS KRUISE! Here's a picture of the stage being set-up for KISS' unplugged set on the KISS Kruise II. Thank you for your patience while we finalize our options. We hope that everyone is making their way to Miami safely and with as little delay as possible. We realize that our guests along the East Coast face the biggest challenge and have arranged the following changes to allow those impacted the best opportunity to join us in Miami or along our itinerary. If your travel plans have been impacted, please contact Sixthman with your flight info so we can monitor your travel tomorrow. If for some reason, your best opportunity is to join us in Cozumel, then your airline should work with you to get you there. Only guests with passports will be able to fly to Cozumel. We will work with any guests who join us in Cozumel to reschedule any potential KISS concert or photo with KISS conflicts. Hopefully, we'll see the whole KISS Navy in Miami and if not, in Cozumel! Today In KISStory - October 31, 1998: KISS kicks off their "Psycho Circus" tour on Halloween night at Dodger Stadium, Los Angeles, CA. The KISS Halloween concert special was aired live on Fox TV. Perhaps the most outrageous interview seen on Snyder's show occurred on Halloween 1979, when the rock band KISS appeared to promote their album "Dynasty". During the interview the conversation degenerated into a somewhat chaotic exchange between Snyder and a very drunk Ace Frehley, who picked up Snyder's teddy bear, put the wristlets from his costume on the bear, and laughed, "the only Spacebear in captivity! I've got him — he's captured!" When Snyder asked Ace if his costume was that of some sort of spaceman, Frehley quipped, "No, actually I'm a plumber." Snyder shot back, "Well, I've got a piece of pipe backstage I'd like to have you work on." The inebriated Frehley replied "Tell me about it!" and clapped his hands and cackled hysterically at the exchange. 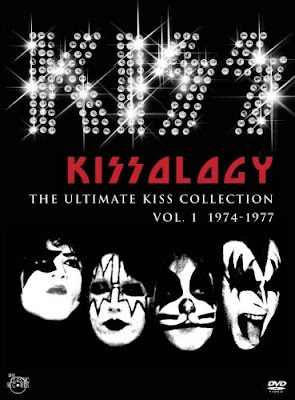 As a promotional effort for Kissology Volume One, National CineMedia promoted a one-night screening of selected portions of the DVD at a limited number of theaters, on October 26, 2006. The screening began with an introductory interview with Gene Simmons and Paul Stanley, and included the documentary of Kiss's 1975 trip to Cadillac, Michigan, as well as a 1976 Cobo Arena concert (both from Disc 1). Today In KISStory - October 31, 2006: Gene and Paul appear on MTV's TRL program in New York's Time Square. Later they are the Grand Marshalls for New York's Greenwich Village Halloween Parade. 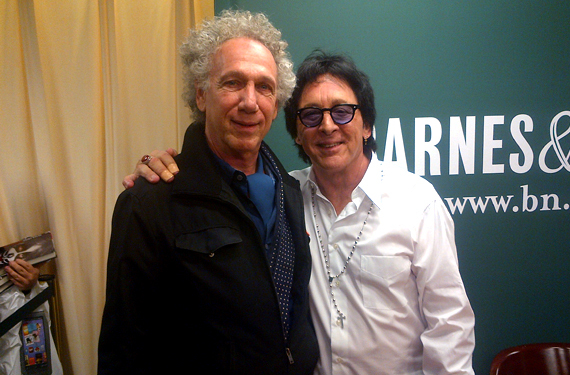 Gene and Paul end the night with a signing event at the Virgin Megastore in NYC. 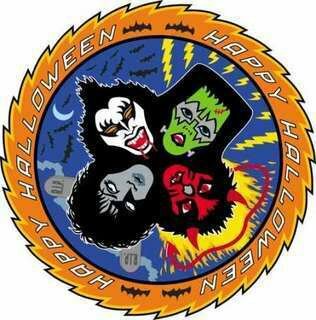 Here's video of Gene and Paul at a press conference at New York's Greenwich Village 2006 Halloween Parade. Today In KISStory - Oct. 31, 1998: The Premier Broadcast Of KISS On FOX's MADtv. Here's KISS singing for a promo for 'Monday Night Football'. We hope that everyone is making their way to Miami safely and with as little delay as possible. If you're already in Miami, we hope to see you at the PRE- PARTY in a little bit! PLEASE NOTE: We'll be delaying our departure out of Miami tomorrow by 1 hour, be on the ship no later than 4pm EST & we'll be sailing to Cozumel, Mexico. 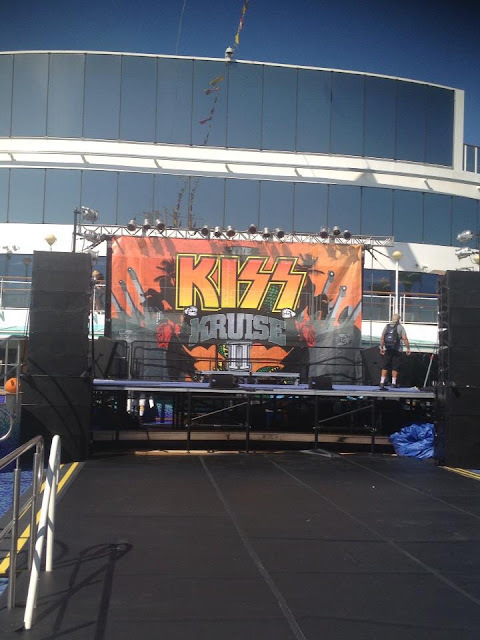 The Camden Family is ready to go on the KISS Kruise II. This will be their second time cruising with KISS and Owen & Willow are officially ready to rock! Check out this teaser clip of the KISS song "King Of The Night Time World" by Gord Prior featuring Spiro Papadatos and Steve Georgakopoulos. "I wish all the people going on the KISS Kruise II a safe journey to Miami. See you all on the boat !" 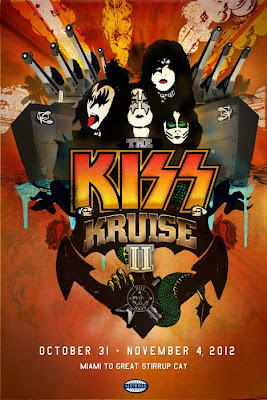 The second KISS Kruise II is setting sail on Wednesday, October 31 to November 4th from Miami, FL to Great Stirrup Cay, Bahamas onboard the Norwegian Pearl. Alexey Covers KISS' "Back To The Stone Age"
Young drummer Alexey performing "Back To The Stone Age" from KISS' "Monster" album. Today In KISStory - Oct. 30, 1998: KISS rehearse for the Psycho Circus tour. Here's a look at the dress rehearsals for the 1998 KISS Psycho Circus tour which were held on October 30th at Dodger Stadium in Los Angeles, CA. KISS Kruisers - We Want You! Are you going on the KISS Kruise II? 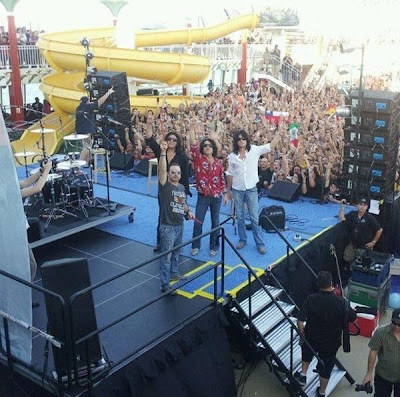 We want you to send us your photos, videos and stories from the Kruise so we can share your experience with the rest of the KISS Army! Send us your photos and more via our "Message" button on our Facebook page. 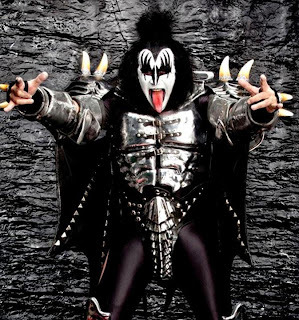 2012 has certainly a great year to be a Kiss fan. We got to see them on THE TOUR this past summer, we got the new MONSTER album on October 13th and now we can add one more cool project to the mix. 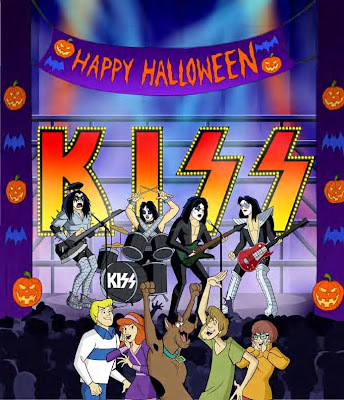 KISSIN' TIME - Canada's Tribute to KISS is a new tribute CD about to be released on October 31st, 2012. As the official website states, it's 13 of Canada's best indie acts, 13 classic KISS songs, 1 CD with all proceeds (minus expenses) going to the SICKKIDS Foundation (Toronto's Sick Kids Hospital). From the tracks I have heard this is going to be a really cool CD and with proceeds going to such a great cause I think it would make a great gift for the Kiss fan in your life. We are aware that Hurricane Sandy is affecting many of your travel plans getting to Miami this week. We're working with Norwegian Cruise Line to delay our departure time from Miami on Wednesday as well as an alternate destination port to allow guests to meet the Kruise on Friday should they miss their Miami embarkation. We hope to have more information to you by tomorrow afternoon, but please know we're putting all efforts into making sure this long-awaited vacation is everything it should be. Please note, there are no plans for a change of departure from Miami on Wednesday, only a potential delay of a few hours to accommodate guests arriving late. Thanks for your patience while we explore our best options. If you need to contact Sixthman while you're traveling, please call us at 877-379-9183. The weather forecast for the Bahamas and Caribbean looks beautiful for our vacation so do your best to get here safely and know we'll be looking forward to seeing you. 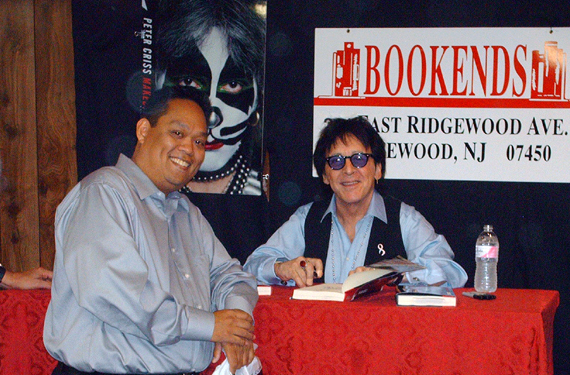 Here's a photo of original KISS guitarist Ace Frehley and a fan at the Chiller Theatre Expo 2012 in Parsippany, NJ on October 26, 2012. 2 standards and as such is a great rock record! Whether songs like the debut single "Hell Or Hallelujah" finds its place in the heart and minds of longtime KISS fans is anyone’s guess. Are the songs on the same level as 1970’s KISS? Probably not, but it shouldn't matter! Much like the band itself, Monster is a guilty pleasure of tried and true lyrical themes, over-the-top guitar solos, tasteful drumming and Paul Stanley’s macho man vocals. Sure the song "Show Mercy" shares a choral pattern with Alice Cooper’s "What Baby Wants" and the album could benefit from the ears of an outside producer (Andy Sneap, for example), but none of this should distract from the fun that Monster is. 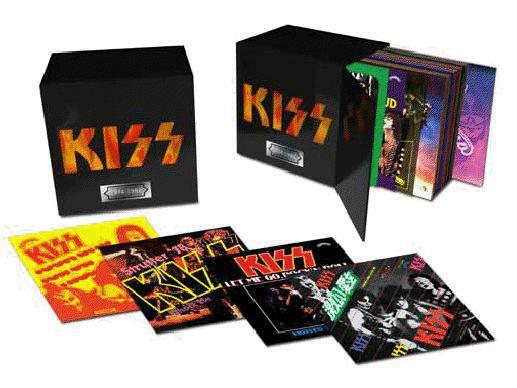 So please, buy the album, enjoy the record and for 47 minutes, forget about "Rock N’ Roll All Nite" and let 2012 KISS take you "Outta This World"
Q: Recently, Steven called KISS a "comic book" band and that’s made its way around the Internet with fans on both sides arguing yes and no. What’s your take on that comment and on KISS in general? Tom: It’s funny. I don’t know where that came from. I guess he just happened to say something in the course of an interview and it got blown up. Q: Like most things do thanks to the Internet. Tom: Well, there’s some entertainment value there... Rivalry. Any story with good conflict in it is interesting. We used to tour with them in the '70s. Actually, we didn't really do that many tours together. We did some shows together and then we parted ways because we had made it and then they made it. So, they were out on their own. There was a rivalry and I remember the dressing room talk about the opening act and what they wear, what they look like and what they do, but over the years I've come to have more respect for KISS through fans that I know. They have very very loyal fans and as far as Steven’s comment in a way their origins are... If you talk to Gene Simmons, he might even agree with it. He was a huge comic book fan like most of us were in our early days... Some of us made a separation between that and what we did musically, but he wanted to live that out with his band and it’s pretty cool. When I want to listen to music, I go back to my Beatles, Stones, Zeppelin and Dire Straits. I don’t think I necessarily listen to KISS that often, but I love that song of theirs "I Want To Rock And Roll All Nite And Party Every Day." It’s just really accurate in describing what teenage males want. Read 'Paul Stanley says Steven Tyler Needs A Reality Check'. Read 'Steven Tyler Reaches Out To Paul Stanley Over War Of Words'. 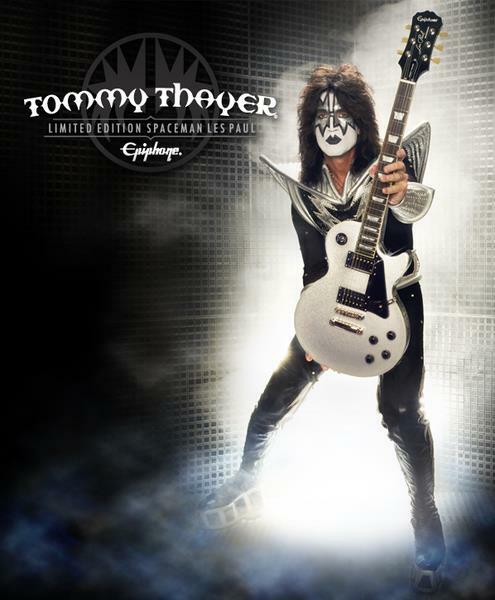 "I'm psyched to be playing my new guitar onstage as we embark on the 2012 KISS Kruise and South American stadium tour in the weeks ahead. My signature axe will soon be available in guitar shops everywhere. In the meantime, the first guitars off the line are ready for you through some very special offers on my new site: www.tommythayerguitar.com. 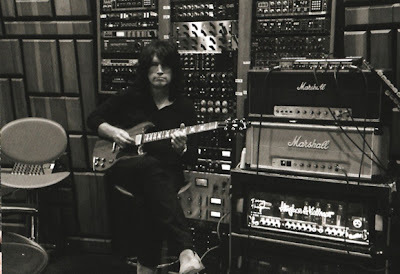 Keep it rockin' & remember to turn it up loud!" Here's KISS on the cover of issue #5 of the German magazine 'Break Out' coming this November. The magazine includes a four page interview with Paul, Gene, Tommy and Eric on the the release of new album 'Monster'. Here's the latest promotional poster for KISS' November 7th show at River plate Stadium in Buenos Aires, Argentina.This poster art is also featured in several newspapers from Buenos Aires. 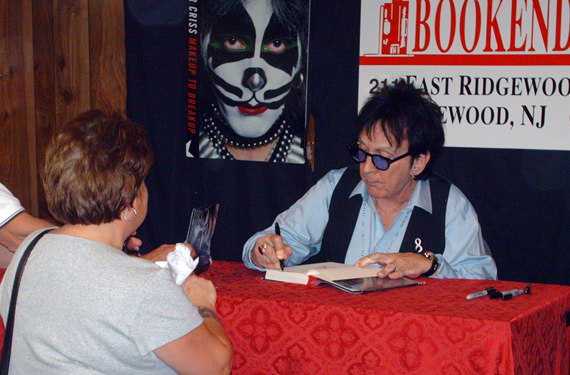 Video: Peter Criss Book Signing In N.J. Here's video of original KISS drummer Peter Criss signing his new book 'Makeup to Breakup: My Life In and Out of KISS' at Bookends in Ridgewood, N.J. on October 24, 2012. 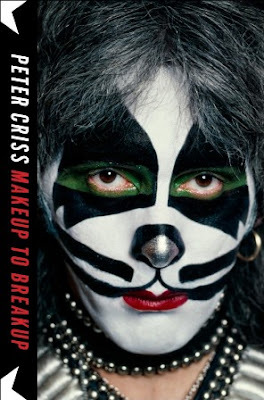 Legendary founding KISS drummer Peter "Catman" Criss signs his memoir Makeup to Breakup:My Life In and Out of KISS on FRIDAY, NOVEMBER 2 at 'Changing Hands' bookstore in Tempe, Arizona at 6PM & 7PM. ed the rock world—composing and singing his band's all-time biggest hit, "Beth" (1976)—but he also faced the perils of stardom and his own mortality, including drug abuse, treatment in 1982, near-suicides, two broken marriages, and a hard-won battle with male breast cancer. Makeup to Breakup is the definitive account of one of rock's most iconic figures. 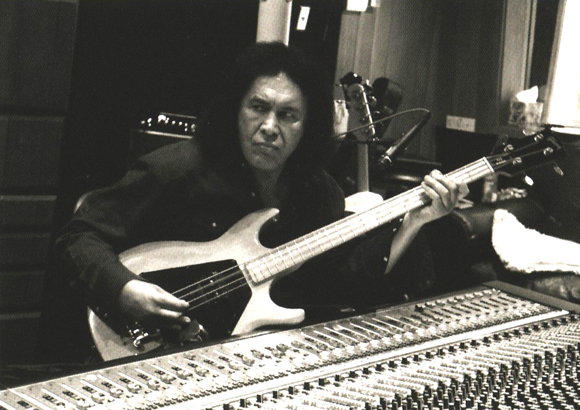 If Santa Anita Park's owners have their way, KISS' Gene Simmons might soon play a starring role at the racetrack. Frank Stronach, whose Stronach Group owns the historic Arcadia racetrack, met with Simmons earlier this month in Florida. Stronach described the meeting as an effort to recruit Simmons to help market the company's racetracks. "Gene Simmons is, on the one side, a great entertainer," Stronach said. "On the other side, he's a very smart businessman and a very nice man. We're trying to see (if) maybe he could do some marketing for us. We're just trying to do concepts." Vocal puppet group 'The Torpedian Harmonists' cover the 1977 KISS classic "Love Gun". Puppet members Spice Ice, Starvey, Gemon and Picoula also wear KISS make-up as pictured below. Follow The Torpedian Harmonists on Facebook HERE. New Jersey group The Static Jacks cover the KISS 1979 classic "I Was Made For Loving You." 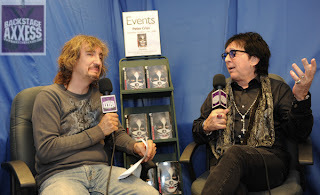 Former KISS guitarist Bruce Kulick interviewed by Jason Saulnier of 'Music Legends' on October 5, 2012. Airing Friday, October 26 at 6 pm ET through Monday, October 29 at 3 am ET on Ch. 39. Taking over Hair Nation for the weekend, Scare Nation is a 24/7 all-KISS, limited-run channel that will showcase music from the band’s entire career. Playing everything from their 1974 self-titled debut through their 20th studio album, "Monster," listeners will also hear the band members talking about their new album, touring, their fans and much more. 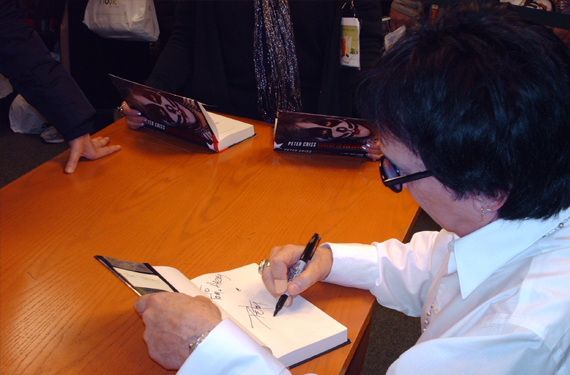 Scare Nation will feature an encore broadcast of “SiriusXM’s Town Hall with KISS” on Saturday, October 27 at 12 pm ET. Dropping The Needle Podcast Talks KISS' "Monster"
In this episode Michael Brandvold and Mitch Lafon geek out on KISS and talk about the new KISS album "Monster". Not so much a song by song review of the album, but a discussion of our feelings. Do we like that album? Yes, but listen for some great discussion. 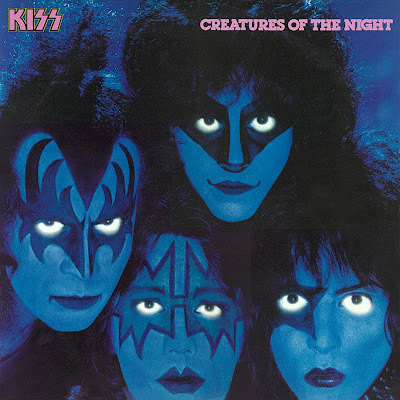 Happy 30th Anniversary To KISS' "Creatures Of The Night"
Creatures of the Night is the tenth studio album by KISS. It is the band's last album for Casablanca Records, the only label the group had ever recorded for at that point. The album was dedicated to the memory of Casablanca founder and early Kiss supporter Neil Bogart, who had died of cancer during the recording sessions. It is also the band's last album recorded with Ace Frehley credited as an official member (until 1998's Psycho Circus), and its first album with Vinnie Vincent as the initially uncredited lead guitarist (Vincent would later be credited, but not featured pictorially on the cover, of 1985's reissue of the album). As ghosts, ghouls and goblins prepare to roam the grounds for Halloween, it seems only fitting that an album called “Monster” is on my mind. While the core of Kiss has changed, the seasoned rockers offer an explosive collection of anthems filled with fist-pumping choruses, fiery guitar riffs and thunderous bass lines that are delivered with swagger and attitude. Gone are original drummer Peter Criss and lead guitarist Ace Frehley, replaced by Eric Singer and Tommy Thayer respectively. Led by Paul Stanley and Gene Simmons, “Monster” is only the second release featuring the new lineup that has played together over the last eight years. In celebration of KISS's 20th studio album, MONSTER, KISS sat down with 20 lucky SiriusXM subscribers and host Jose Mangin for a fan Q&A. Here, they describe the origins of their anthem "Rock and Roll All Night" and even some never-before-revealed alternate names for the band. Gene Simmons and Paul Stanley describe how Eric Singer and Tommy Thayer make the current lineup of KISS the most powerful of their career. The band sat down with 20 lucky SiriusXM listeners for a special fan Q&A in celebration of their album, MONSTER. "Heading to rehearsal.. Gonna decide on some cool songs to do on the Kruise. How about 'Only You'?" Heading to rehearsal.. Gonna decide on some cool songs to do on the Kruise. How about 'Only You'?